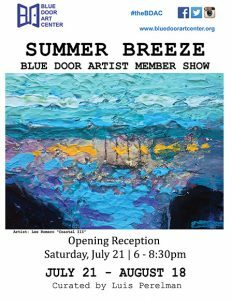 Join us for the opening reception of the Summer Breeze Artist Members Show on Saturday, July 21, 6 – 8:30pm at the Blue Door Art Center. This show is a summer showcase for our Artist Members, some of who are experienced artists and some debuting their work. The show is curated by Blue Door executive director, Luis Perelman and features a wide variety of mediums. See the art work, meet the artists, wine and cheese, all welcome! Add to your art collection or start and new one. Be a part of the vibrant Yonkers art scene. The show runs from July 21 – August 18, 2018. Gallery Hours are Thursday and Fridays from 3 – 6pm and Saturdays from 1 – 5pm. 13 Riverdale Ave. Yonkers, NY 10701 www.bluedoorartcenter.org [email protected] We are located just two blocks from the Yonkers Metro North Station. The Blue Door Art Center's programming is made possible by ArtsWestchester with support from the Westchester County Government. The Blue Door Art Center is also made possible in part by the generous support of Westhab and the City of Yonkers.